Wind rustled through the garden. 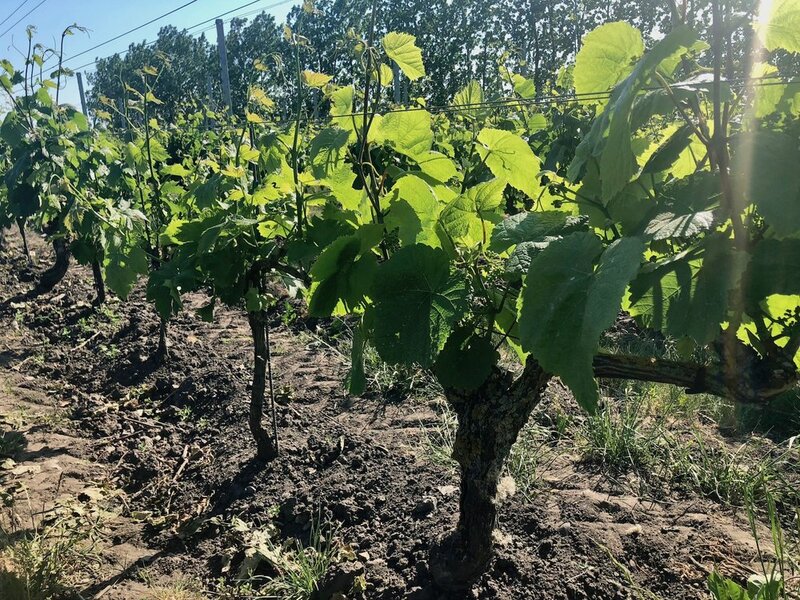 Soft from afar, then flapping quickly like a rain stick or a far off waterfall as it met the bowed green branches of the tree that hung over a path between bushes over which vines crawled up the arbor, the open door to the vineyard beyond. Persistence of breeze and the rattling of leaves mixed delicately with the sound of soft conversation on whose every word I hung, and the sound of dogs playing in the yard. 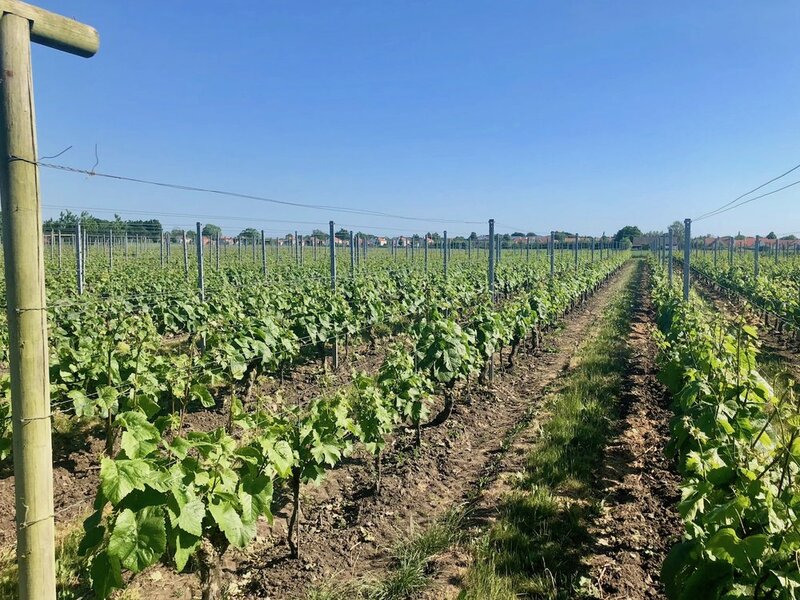 Rows of meticulously trellised vines stretched flatly, in perfect repeating point perspective beneath cloudless blue sky until they met a line of houses a ways off, white-walled, red-roofed, encircling the vineyard in which grew the curious Rondo and Solaris grapes. I lifted my glass so that those branches refracted through its contents. Watched it swirl like translucent gold that softened every detail of the world around me. "White wine is not easy to make good quality." Our host looked at us. This had been a truly wonderful conversation, one of those moments reflecting on the world and the wine and the nature in which it grows. He asked me what it was I loved about wine. I told him how I so often find good wine to be the perfect reflection of the particular corner of the world in which it is made. Terroir, we call it. It was a good conversation. Some of the best conversations are had in vineyards. But this wasn't a vineyard in Bourdeaux, or Ribera del Duero, or Sonoma, the North Island, or any of the other places that you'd know because of its history in wine. We're sitting in the garden of Vingården i Klagshamn, the vineyard in Klagshamn (I'll let you guess what "Vingården" means), Skåne County, in the south of Sweden. Copenhagen is a thirty-minute drive west across the bridge that spans the Öresund, the straight that separates Denmark and Sweden. Malmö, Sweden's third largest city, is twenty-minutes to the north. I first wrote of Klagshamn's wine last year after a visit to the Swedish Taste restaurant in Gothenburg. Something feels different a year on. I struck up several conversations with wine servers and sommeliers in Stockholm just several months ago. Their attitude about Sweden's wine was different than what I've encountered in years past. I heard about Ästad Vingård and the sparkling wines they are producing on the west coast about a third of the way from Gothenburg to Malmö. And a mysterious wine called Pegasus that is produced in the town of Flyinge. It is allegedly the best in Sweden, but short of driving to Flyinge I've not yet been able to get my hands on a bottle. There are now about thirty-five wineries in Sweden, of which twenty-five are in Skåne to the south. Production is still small, but it seems serious now. So we sat in the garden drinking the latest vintage of Inkognito and the latest bottle of the multi-vintage Ego4 white wines with our hosts, Lena and Murat. Their wines are on the forefront of what is happening here. I was so grateful that they shared their work with us. 2016 Vingården i Klagshamn "Inkognito"
Murat had not yet released his 1,000 bottles in late May of 2018, and with 16.5% alcohol he wondered if he'd ever release it in Sweden. It is, he explained, a very different vintage than the year before (see my tasting notes on the 2015 vintage here). It was very warm -- about 26 Celsius or nearly 80 degrees Fahrenheit -- in September when they harvested. Aged in 50% oak barrels, it is a beautiful mid-gold color in the glass. Made entirely from the Solaris grape, its nose is floral with fruit notes of lychee and kiwi, and a bit of sea air, like low tide. I was pleased to have recognized this when Murat explained that he had fertilized it with seaweed. We are near to the coast here. Compare this dry wine to a Viognier, though lighter and far less creamy, with sharper acidity. Murat mentioned having paired it with a dish of asparagus, mozzarella, and fried egg. NV Vingården i Klagshamn "Ego4"
Klagshamn's "Ego" wines are multi-vintage, that is to say the bottle we drank on this occasion was blended in the barrel from each of the five harvests from 2012 through 2016. It is the "fourth" edition. Expect it to be less fruit forward, more complex, perhaps a unique pairing to smoked duck. This best seller of all the Klagshamn wines in restaurants seeks to be less fruity and more mature than its cousins from the same vineyard. It's beautiful darker gold in the glass, with notes in the nose of cedar, wooden embers, butter, and a touch of apple. The apple is more assertive on the palate, who with notes of gently toasted brown sugar reminds us of the sophisticated qualities of a Port wine. I asked Murat what he might like to try making next. Frühburgunder might interest him. Fitting given that it's essentially a mutation of Pinot Noir that ripens early and is therefor suited to cooler climates. Indeed, Swedish wine has an exciting future ahead.